Fowler's Ultra-Logic Indicator series features a complete line of electronic indicators and probes in measuring ranges from .250" through 4.0" with resolutions of .0001" (.002mm), .00005" (.001mm) and .0005" (.01mm). 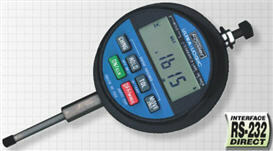 Ultra-Logic Indicators are one of the world's most advanced digital indicator with the most features in one gage. Features are either user-selectable or user-programmable. Special features include Absolute/Preset mode, TIR Mode, Max. Hold, Min. Hold, Display/Freeze hold, presettable tolerances and feature lock. All Ultra-Logic Indicators are supplied with data input/output ports. Three types of output are available--Direct RS232, Present BCD Parallel and Pseudo RS232 (MTI type output). The gage automatically recognizes and changes the output when you attach the appropriate cable. Port is available for remote applications such as remote hold, remote clear and even supplying power to the gage from a remote source. Incremental measuring mode referenced from zero datum. Zero can be set anywhere along the travel. Preset Measuring Mode (absolute). Ability to enter a preset value or offest. Easy to use. Value retained when gage is off. Max. Hold will constantly display the highest measurement in this mode. When reset, the gage will not lose zero or spindle position. Min. Hold will constantly display the lowest measurement. When reset, zero or spindle position is retained. Freeze Hold will freeze display when Hold Butoon is pressed. Press again and you are at true spindle position. Optional external power allows user to power indicator through the data port. Data collector or computer supplies power to gage. Auto-off after 10 minutes. It is bypassed with an AC adapter. Feature lock secures the selections made by the operator. Glass scale measuring system offers superior accuracy and repeatability. Large direct drive LCD display dramatically improves view. Tolerance limit mode. Allows user to input high and low tolerances. When tolerances are exceeded, the display will flash and high or low will display as well. This feature can be turned on and off and tolerances will remain in memory. Bezel rotates 270° for convenient viewing. RS232 Output allows connection to most RS232 serial ports on computers, printers, etc. BCD parallel and MTI type serial also included. Travel reverse allows you to change direction of the spindle electronically (±). Zero set can be set anywhere within the range of travel. Serial number on each unit for traceability.